A house to rest. A garden open to the valley and the pleasure not to hear any noise of cars and traffic. The confidence to sleep with the windows wide open on the starry night. This has been since 1972 the home of the weekend and our summer holidays. We restored piece by piece with our hands and furnished (we hope!) decorated. 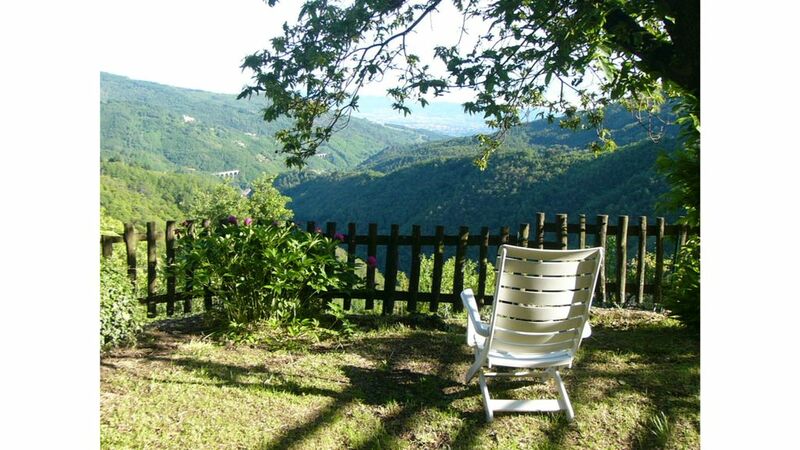 The privileged location at the foot of a hamlet lies on the hills of Pistoia allows you to have an unsurpassed view and especially the advantage of having no homes or attached to the side gardens and thus enables the total quietness and privacy. This however requires the effort of not being able to park the car in front of the house. The meters to walk no more than 60 and on paved ground. Basic but it is not a suitable place to people with poor mobility or with wheelchair. Our house is located in a small hamlet perched on the hills near Pistoia. The hamlet is called "Casaccia" and consists of 5-6 houses inhabited by residents and 3-4 as holiday homes. The nearest town is Piteccio (3 km). Here you will find the grocery store with fresh bread, fruit and vegetables, pharmacy, post office, bars and bus stop COPIT to reach Pistoia. The car is essential! Public transport comes to the village of Piteccio (autubus 25). From here we have to go 3 km of which 2.5 uphill. ideal place to spend a few days of total relaxation! Enjoy the wonderful scenery, the silence, the sun and cool temperatures even on the days of sun. In a few minutes can be reached Pistoia and from there - by train or car - Lucca, Pisa, Florence, Prato the Montalbano hills with Carmignano, Artimino and Vinci. You enter through a gate directly on the pergola terrace in front of the house. On the right side of the house a large garden with a huge fir in the center and a corner with barbecue and wood-burning oven where you can cook wonderful roasts and bake pizzas to remember! The house is on 2 levels. On the ground floor a living room, a dining room with fireplace and a fully equipped kitchen with dishwasher, refrigerator, electric oven, ceramic glass hob, toaster, kettle. Upstairs there are two rooms: a large bedroom with full bath shower and a second smaller one with a double bed can be divided into 2 single beds. In this room there is a small bathroom with sink and toilet. A third small room will not be available to the guests and please understand if you find the door locked. You will have the whole house, except the small bedroom (where we will keep our things) and an outside storage room. The highlight of the house is of course the outside with the garden, the terrace in front of the oven and barbecue next to the house. We (Marcello and Rowena) we do not live in this house but in Prato (about 30 km). During the booking stage you will answer my daughter Elena. My daughter will be available via SMS, email, whatsapp, and also by telephone for any clarification / necessity. Even my wife and I will be ready to intervene in extraordinary cases. In case of urgent need, there are always people in the hamlet to which to refer. A person of our trust resident in the hamlet, will hand over the keys and welcome you in the event we were unable. We provide the house for exclusively summer rentals (generally from May to September) and on a weekly basis. You will find the house clean and bed linen, bathroom and kitchen available. Lovely setting, amazing views, friendly neighbours, fantastic BBQ.. cautious drivers please note, the road up is a little bit challenging. Nous avons passé un très agréable séjour dans cette adorable "casuccia", véritable nid d'aigle avec vue plongeante sur Pistoia et sa vallée ! Das gut ausgestattete, sehr persönlich eingerichtete, gepflegte Ferienhaus liegt in einem kleinen abgelegenen Weiler auf 500 m Höhe im Wald oberhalb von Piteccio in der Nähe der sehr schönen Stadt Pistoia, die in nur ca. 20 Minuten mit dem Wagen zu erreichen ist . Die letzten 3 km der Anfahrt von Piteccio sind anspruchsvoll, da die Straße sehr schmal, teils steil und mit Schlaglöchern und engen Spitzkehren versehen ist. Mit ein bisschen Übung und Mut geht's dann aber gut, da es nur Anliegerverkehr gibt. Die Aussicht von der schattigen Terasse und den sonnigen Garten bis ins Montalbano ist sensationell und es ist absolut ruhig bis auf das wunderbare Zirpen der Zikaden. Dank der Meereshöhe kann man auch in der heißen Zeit gut schlafen, da hier oben immer ein frisches Lüftchen weht und es nachts kühler wird. Ein Nachteil ist, dass man direkt von Haus aus nicht wirklich wandern kann, da die bestehenden Wanderwege zugewachsen/nicht (mehr) passierbar sind. Super gäste mit 3 super Hunden! Auch unsere Nachbarschaft hat sie gelobt! Was kann man sich mehr wünachen? :)) Gerne wieder bei uns und gerne empfehlen wir diese Gäste Andersen Gastgebern.